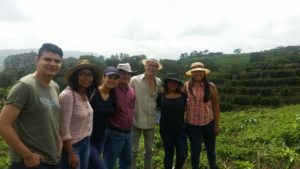 Five students from Universidad Centroamericana José Simeón Cañas of El Salvador won an internship at EARTH University. From left to right: Alberto Rivera, Melissa Ruiz, Daysi Calderón, José Cruz, Luis Guillermo Ramírez, Fabiola Ventura and Adriana García. Adriana García, Alberto Rivera, Melissa Ruíz, Daysi Calderón and Fabiola Ventura got together two years ago to participate in a project called Regional Integration, University and Sustainable Development in Central America (known as IRUDESCA in the Spanish-speaking world). The organization works to propel the success of regional businesses through the talent development of students, from Guatemala to Panama. During this time, the five students brainstormed about the sort of sustainable project they wished to pursue. They had agreed it would need to wield socioeconomic impact as well as improve environmental well-being. They ended up building Groot, an enterprise utilizing coffee pulp (a discarded product) to produce saleable goods, including alcohol, molasses, animal feed, biogas and more. After developing the project, the Groot team competed in one of IRUDESCA’s contests, against others from their school. They beat out the competition to win the grand prize: the opportunity to further enhance their project and knowledge during an internship at EARTH. The winners spent three weeks on EARTH’s campus in Costa Rica, digging into the particular subject areas that would equip them to continue pushing their project forward. Their lessons ranged from learning the science behind making compost to finding low-cost environmental solutions to everyday issues – and the five loved every minute of it. Upon returning to El Salvador, the students were buzzing with energy to use their internship learnings to tackle environmental issues in the country. They expressed gratitude to the University community for the lessons involving conservation, scientific research, technical knowhow, and community work. IRUDESCA strengthens the relationships between various universities and reinforces the shared socioeconomic fabric of Central America and Europe through work involving cooperation, respect for the environment and people, as well as the role and responsibility of universities in the formation of ethical professionals. For more information about this project, please contact grootsv@gmail.com.